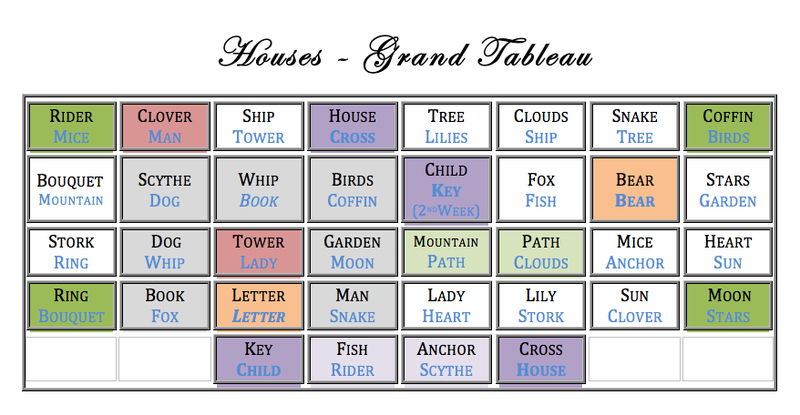 I’ve been working on teaching myself different operation as relating to the Grand Tableau. My main source of information is Andy’s detailed blog posts where he shows the system he was taught. 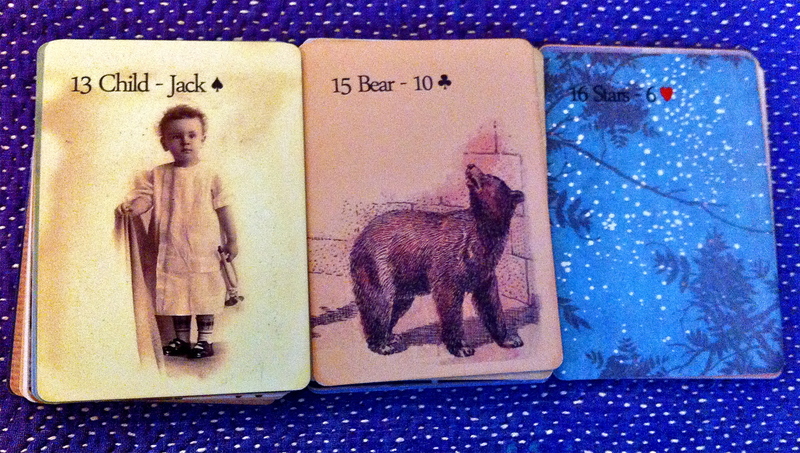 Just before assembling the GT I cut the deck one last time into three groups, and observed the bottom cards in each pile: Child + Bear + Stars. 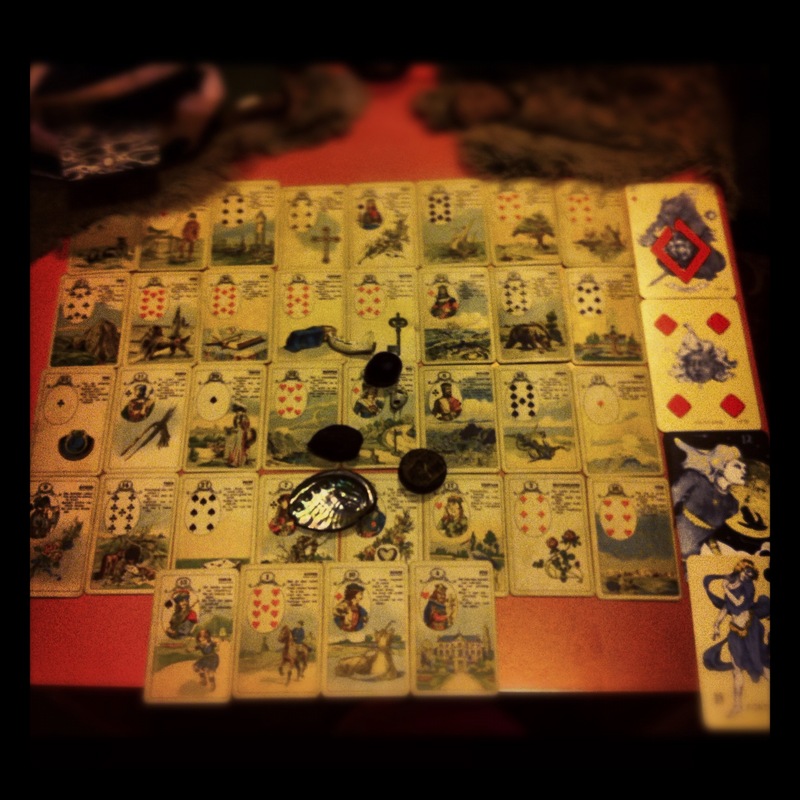 This method expresses the theme unfolding “behind” the tableau and throughout the reading. 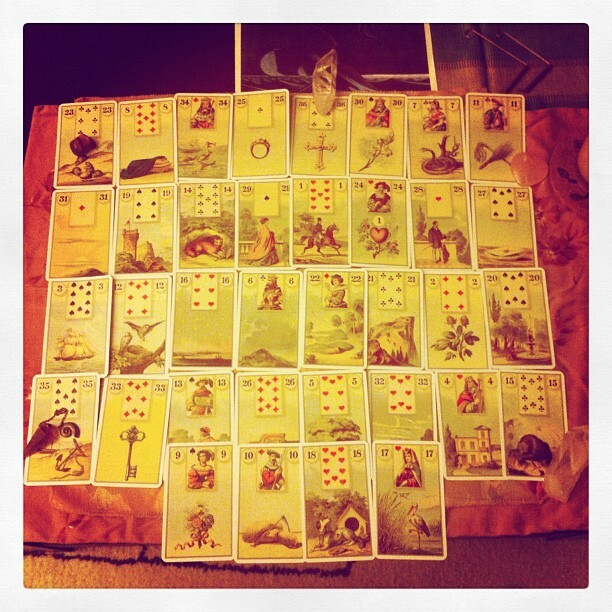 These are positive cards: I feel guidance, hope, and strength in regard to new beginnings and fresh starts. Also, being a mother I can’t disregard the powerful connection between Bear and Child. These cards hold special significance outside of GT, speaking of issues needing immediate attention.There are several things I find very interesting: (1) I work at a school, so seeing House + Book always makes me think of my job. (2) I would interpret this specific trio as: traveling to a house of education… Or NOT, lol. I drew this GT around 5PM on Sunday evening, and by 9PM I felt under the weather enough to make an executive decision to stay home the next day. Frankly, I am a bit intimidated by this week’s GT. I don’t like seeing my card (Lady) all the way in the top, right corner. It tells me that my current actions and decisions will greatly influence my future. I understand it intellectually, but it also makes me feel stuck. 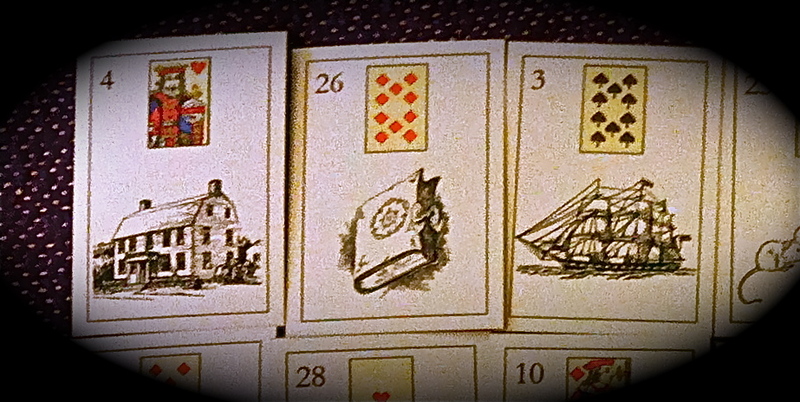 Luckily, the Lady card is in the top raw, meaning I am aware and largely in control over the the events and information depicted by: Bouquet; Lily; and Stork (positioned vertically). I am also concerned for the Scythe + Rider + Tree combination in front (future) of the Gentleman card, which represents my husband. I am specifically concerned about health issues and road accidents. House — The Focus is on home and family. House + Stork= A classic combination for moving houses, but clearly isn’t on my agenda this week. I wonder if it’s connected to us wanting to travel to my homeland this summer, if my husband’s education-related issues can be resolved? Lady + Sun = Feeling happy and satisfied. Possible theme: I’ll feel happy because we’ll book tickets to travel to Israel this summer. These are special, and often isolated events that are bound to happen, and quickly. Fish (A1) + Heart (A1) = Setting my heart on a business venture. Ring (A2) + Anchor (A2) = Stabilizing / grounding a contract or commitment. Mountain (A3) + Star (A3) = A calculated (lucky) delay. Even though I set my heart on a certain business, there’s a need in taking time and consciously delaying things in order to ground a contract or commitment. Key + Child = The answer is in a child, or in a new / small beginning (a reoccurring theme for the past 3 weeks). Tower + Moon = Creative ambitions. Ship + Mice = Unpleasant perspective. I am reminded of the phrase: Rats leaving a sinking ship. I wonder what ship is about to sink, and who are the rats — or mice in this case? The solution lies in a new beginning (possibly relating to an actual child), generating some creative ambitions that will also bring in an unpleasant perspective. 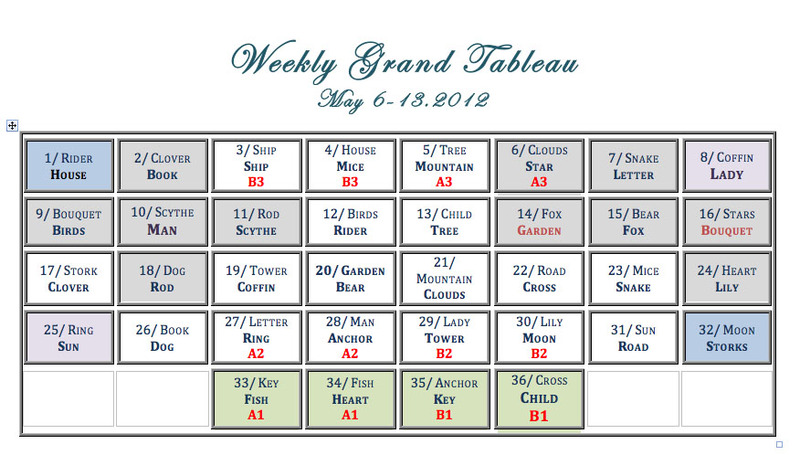 I hope to do more GT decoding throughout the week, but at this time I am not sure how much time I’ll have for updates. 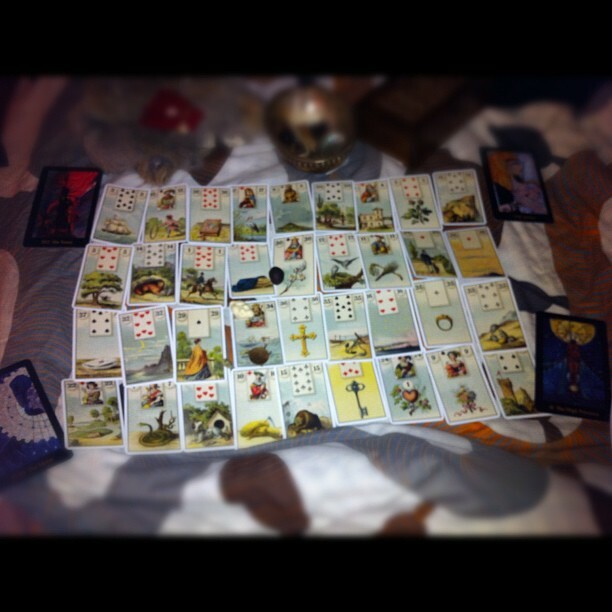 In addition to the French Cartomancy deck, I pulled 4 cards from the Mary-El Tarot. 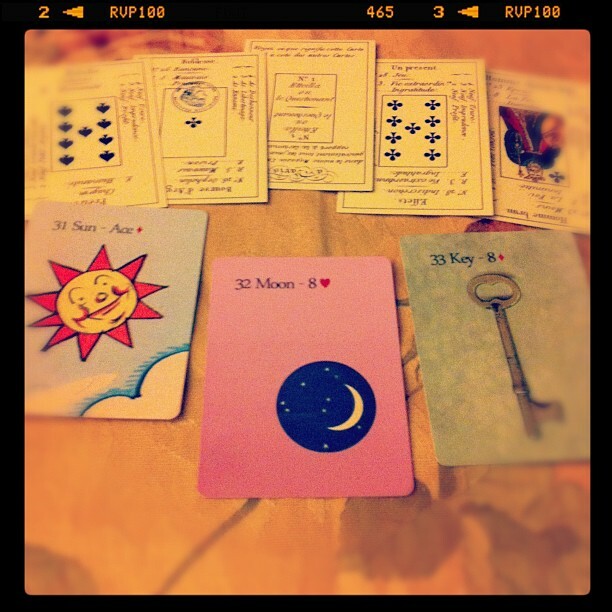 4 Majors: The Tower + Justice + High Priestess + The Moon. How about that?